Several new chef-driven restaurants have opened recently that offer unique concepts and sensational cuisine, including two that have quickly become our favorites: The Winery Newport and Pirozzi in CdM. 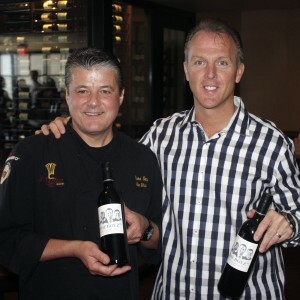 Over the past six years, The Winery Restaurant partners JC Clow, William Lewis and Chef Yvon Goetz have earned a reputation in the OC culinary world as having exceptional food, a classy and upbeat ambiance, and excellent service. Their flagship Tustin location has successfully blended contemporary California regional cuisine with a sophisticated yet unpretentious setting. They have been recipients of many awards and honors, so we hoped those accolades would carry over to The Winery’s second location on Coast Highway where the classic Villa Nova restaurant once stood. 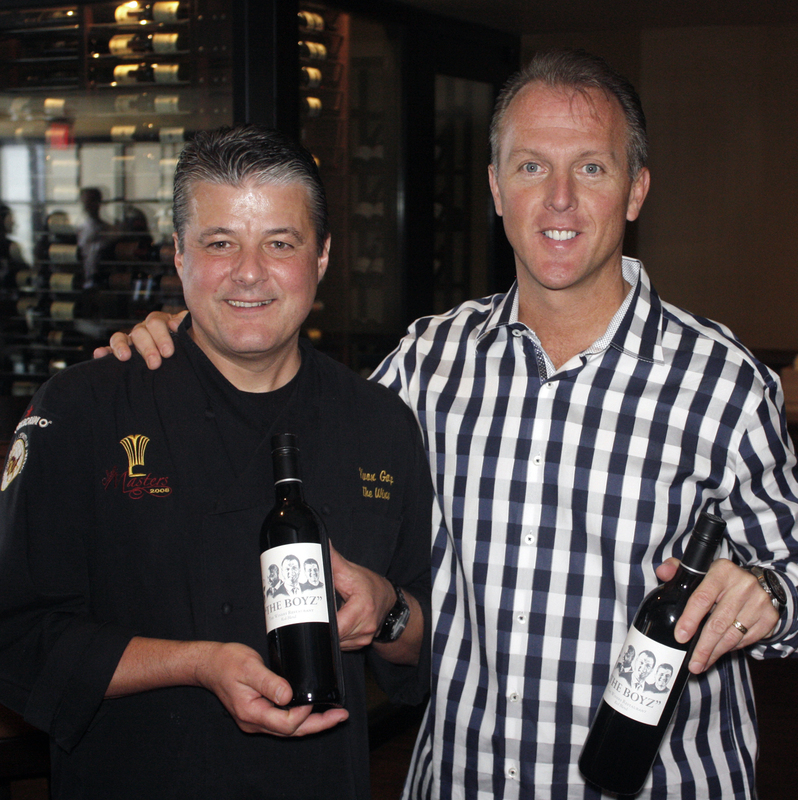 After enjoying a preview dinner prior to the restaurant’s official opening several weeks ago, and having returned several times to sample more dishes, we can confidently state that The Winery Newport is quickly becoming a culinary landmark. The menu focuses on wild game and USDA Prime steaks, as well as Pacific Rim favorites such as fresh Opah, Mong Chong, Ono & Mahi Mahi, all flown in daily from Hawaii. We’ve tried a variety of dishes, from venison to mahi mahi, and have been impressed with the flavors, textures and creativity of each dish. For our most recent visit, we had the black pepper crusted Colorado buffalo Carpaccio topped with a truffle vinaigrette and mixed greens. 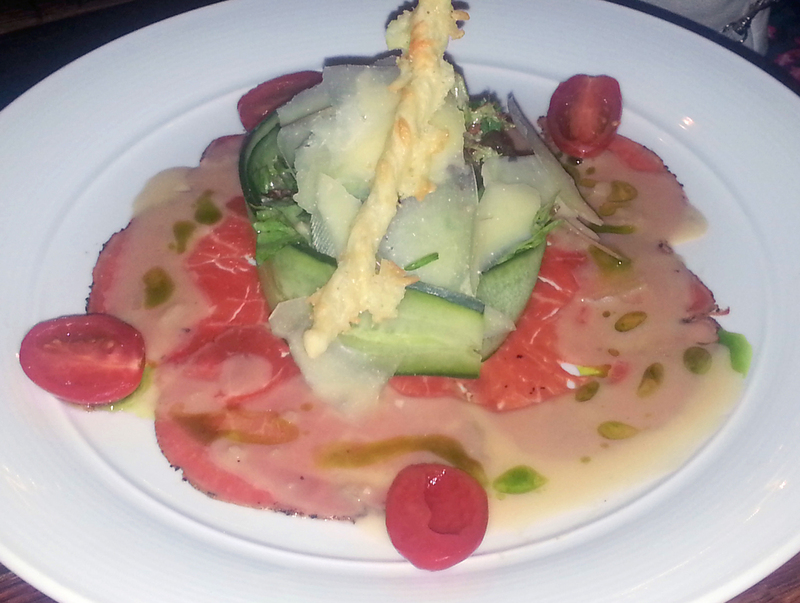 “The truffle vinaigrette really brought out the flavor of the raw meat without being overpowering,” noted Catherine. After getting recommendations from our server, we opted for The Winery corkscrew pasta, which came with generous chunks of grilled Sonoma chicken, baby artichokes, oven dried tomatoes and a basil pesto sauce. The menu may please the palate, but the decor dazzles the eye. Guests are greeted by an entrance way made from wine barrel wood, a two story wine cellar that holds 5,000 bottles, high top bar tables made from the insides of wine barrels, a bar top made of agate that’s mined in Madagascar and shipped to Israel to be cut and polished, and Spanish flooring. There’s also an upstairs bar, private dining rooms, a cigar patio, fireplaces, flat screen TVs, and other amenities. Between the dining room and the two bars, The Winery can accommodate nearly 300 guests. 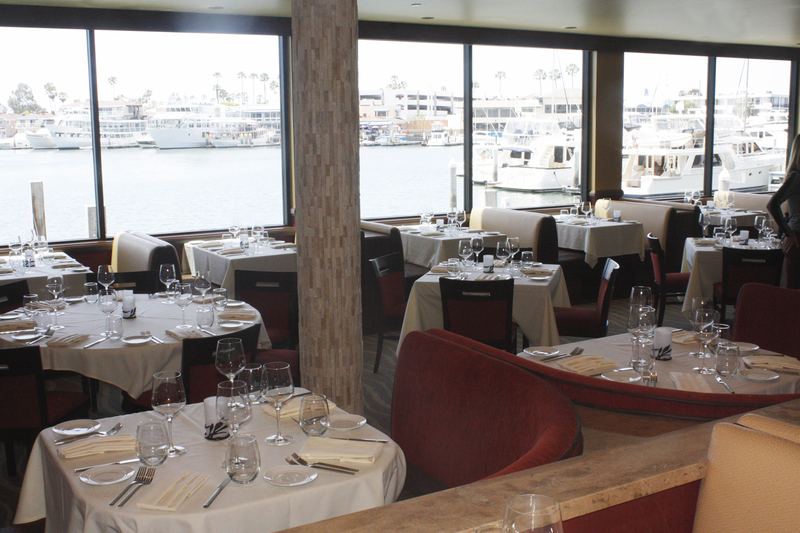 We were impressed by the classy architecture, the wall of glass that affords sweeping views of Newport Harbor, and by the staff that made us feel welcome from the moment we walked through the door. The Winery’s boat docks can accommodate up to a dozen Duffy boats for those diners who prefer to arrive via water. “When we take your reservation, we ask if you’re arriving via land or sea,” says Clow. 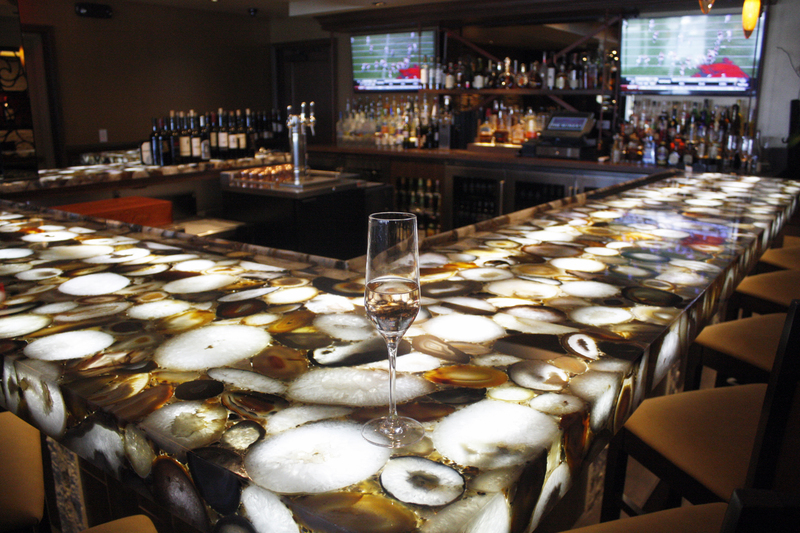 The Winery Newport is one of the hottest dining spots in town and reservations can be hard to come by, especially on the weekends, but we discovered a secret: Dine in the bar or lounge area. The bar opens at 4, and if you arrive between 4 and 5 p.m., you can get full dinner service. The Winery is open nightly for dinner at 5 p.m. For more information, visit thewineryrestaurant.net. Alessandro Pirozzi had made an indelible stamp on the local dining scene with his distinctive Italian restaurants, including Alessá Laguna Beach and Mare Culinary Lounge, also in Laguna Beach. 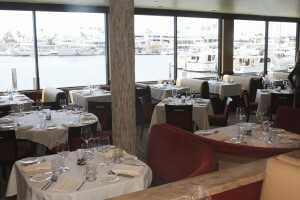 Now, he has returned to Newport Beach with a new restaurant: Pirozzi Corona del Mar. 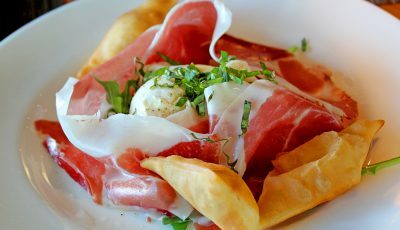 Pirozzi is a small neighborhood eatery that fits perfectly into the CdM atmosphere. The intimate dining room and patio offer table seating, while a tiny bar and lounge area is tucked into a corner near the open kitchen. We went there last Tuesday and found a 45 minute wait for a table, but managed to grab two bar seats. After perusing the menu, we ordered an appetizer, pizza, and dessert. “I love the margherita pizza—the crust is firm yet soft, and it’s perfectly done,” said Christopher. We learned that much of the food is cooked in the large pizza oven that Pirozzi ordered from Italy. It maintains an even 900 degree temperature, and cooks pizzas in under a minute, beef dishes in four to five minutes. We finished our meal with housemade cookies and cream gelato. Pirozzi Corona del Mar is located at 2929 E Coast Hwy in Corona del Mar. 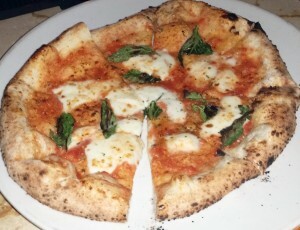 Call (949) 675-2932 or visit pirozzicoronadelmar.com.